From left to right: Development Coordinator Jennifer Kohms, Education Coordinator Rachel Popp, and Joseph Tapia, working together to clean an historic gravestone. Thanks to generous donations to our Annual Fund and those who purchased tickets for our 2016 Twilight Tours, we are preparing to hold our second Cemetery Preservation Workshop. On Saturday, April 29th from 11 a.m. to 2 p.m., Education Coordinator Rachel Popp will demonstrate proper historic gravestone preservation techniques based on VDHR (Virginia Department of Historic Resources) guidelines. 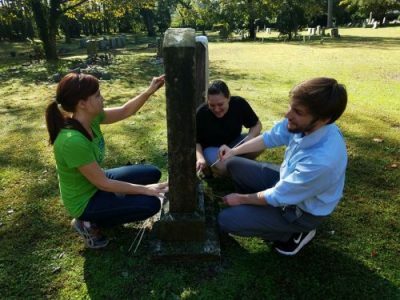 Under the guidance of our Education Coordinator, volunteers will gain hands-on experience in Cemetery Preservation by cleaning historic gravestones themselves. All volunteers are welcome and encouraged to wear clothes they don’t mind getting dirty. This workshop will focus on a few of the larger gravestones in our cemetery that are located near the church building, one of which belongs to Henry Mason Day, the first president of Historic St. Luke’s Restoration which was created during the 1950s. 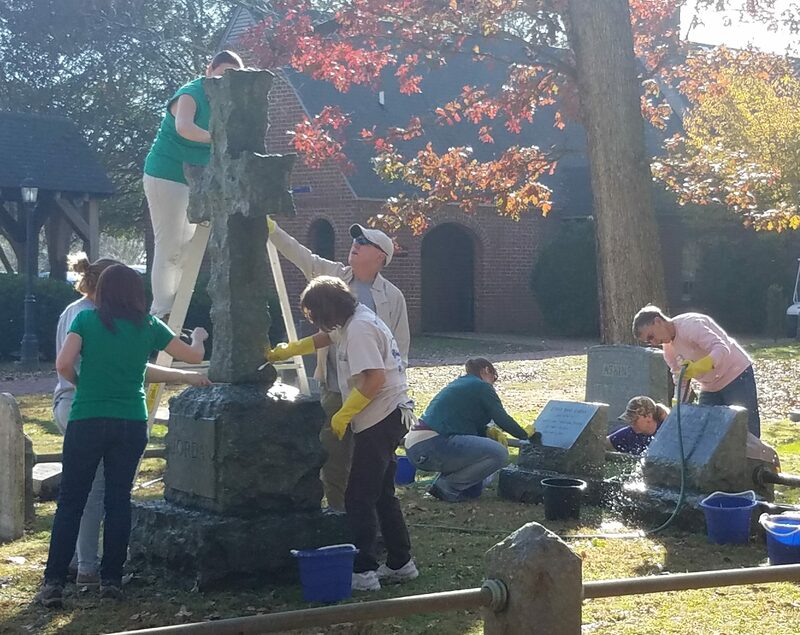 Other gravestones to be cleaned include that of Joseph W. Luter Jr., Joseph W. Luter III, and Pearl Luter Clontz, who are all former supporters and board members of the site. Volunteers cleaning historic gravestones during a Cemetery Preservation Workshop at Historic St. Luke’s. To participate in this free workshop, please email Education Coordinator Rachel Popp at rpopp@historicstlukes.org or call Historic St. Luke’s at (757) 357-3367. Lunch and all of the necessary tools for the workshop will be provided. A portion of all proceeds from Twilight Tours and Annual Fund go to preserve, protect, and promote this historic cemetery.